China is moving ahead with plans to evaluate provincial officials on the environmental consequences of their decisions – even long after cadres have left office – but auditing experts say making such calculations is inherently difficult. The scheme, which involves scrutiny of damage officials incur on the environment during tenure, and punishments to be carried out over a lifetime, is due to be rolled out across China by the end of the decade. The central government wants to back up a raft of new or revised environmental laws with rigorous enforcement and tough penalties for those involved in pollution of China’s air, water and soil. But measuring or auditing an official’s impact on the environment won’t be easy, points out Sun Xinghua, deputy chair of the China Environmental Sciences Association’s auditing committee. China would have to establish a baseline or benchmark on the condition of the environment on a particular date, and in a particular locality, before an official’s performance could be audited effectively or fairly, says Sun. For such work to be carried out effectively, authorities will need to ensure companies carrying out audits are independent and ‘corruption-proof’. A coordinated and accurate audit would also require environmental, land and water authorities all working together, Sun adds, and a much more prominent role for the ministry of finance, which has little experience working on environmental issues. “There’s no consideration of environmental (value) in the entire system. How many hundreds of millions did it cost the state to clean up Dian Lake? How effective were those efforts? Has there been an audit of the outcome? No. For Lake Tai? 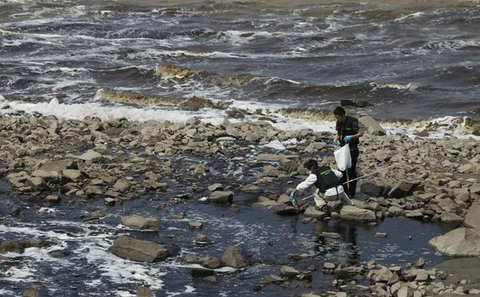 Again, no,” Sun says, referring to two attempts to clean up heavily polluted lakes in China. Another obstacle lies with attempts to determine the value of wetlands, rivers and lakes. If nobody puts a price on environmental pollution, it can’t be included in accounts, adds Sun, who has experience of auditing a water treatment plant in the Beijing district of Chaoyang. During his tenure there, owners of the treatment plant suppressed a report that documented how the company wasn’t monitoring its output of greenhouse gases correctly. China has few case studies to draw upon that could serve as models for a future national system of environmental auditing, although the provinces of Shandong and Guizhou are already exploring ways to enforce accountability in the use of natural resources. In early March, a report from the Ministry of Environmental Protection (MEP) chose Lanzhou as the first city in China to trial environmental auditing. The current pilot scheme for environmental measurement stems from a 2004 report headed by Wang Jinnan, deputy head of the MEP’s Academy of Environmental Planning, which investigates government environmental auditing systems. The plan is to carry out trials of audits when officials leave their post in ‘typical regions and cities’, and to roll the system out nationwide after the 13th Five Year Plan (2016-2020) period. In the private sector, one of the main aims of environmental auditing is to ensure costs of cleaning up pollution and environmental damage are measured accurately as a cost, and then factored into calculations of a company’s value. Undaunted by the challenges of accurately measuring the economic value of natural resources, MEP vice-minister Pan Yue has tried to bring about reform by investigating whether China can measure ‘Green GDP’ in a way that costs of pollution are deducted from headline GDP figures. Sun, who also heads the Chinese Academy of Sciences’ Sustainable Development Research Group, proposes deducting two percentage points from annual GDP growth figures to account for the environmental deficit over ten years. The government’s own Green GDP task group, meanwhile, has gone further, recommending figures for 2004 be slashed from the headline 7% to a much more modest 4%. “We think Green GDP calculations need to start at the bottom – with environmental accounting and basic calculations,” Sun says.